Police officers investigating a burglary at a shop in Lisburn in the early hours of Monday, June 12 have appealed for witnesses to come forward. The incident occurred at Windmill Stores, Ballymacash Road at around 3:15am. The thief/thieves attempted to steal cigarettes, but left empty handed. 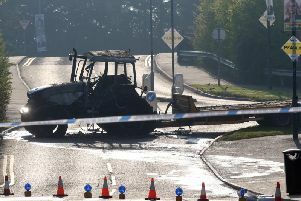 A black coloured car, possibly a Vauxhall Astra, was seen making off from the area in the direction of Knockmore Road. “Did you see anything or anyone suspicious. Can you assist Police with their enquiries. If so please contact Lisburn Police on 101 quoting reference 143 12/06/17,” a PSNI spokesperson said.